Rice is at the heart of a fierce strategy debate as the country prepares to launch the second Green Revolution in the eastern states. Policymakers and scientists have drawn up ambitious plans to increase the productivity of this cereal which feeds two-thirds of Indians. Enormous funds are being poured into research aimed at improving seed varieties, with a heavy focus on developing hybrid rice. Is it the right option for millions of small rice farmers who are already battling high input costs and increasingly unpredictable weather? Or does part of the solution lie in efficient methods of cultivation that will cut down water use and improve yield? Latha Jishnu analyses these varied strands as she visits research institutes and gets down into the paddy fields of Odisha and Andhra Pradesh to understand what might work. She discovers that traditional rice varieties are making a significant comeback in Odisha—as in Karnataka, where Aparna Pallavi finds some farmers have abandoned high-yielding varieties in favour of indigenous varieties and organic farming to meet the challenges of climate change. From West Bengal, Sayantan Bera reports that the largest rice producing state has a different set of problems to contend with if it has to reap the promise of the new Green Revolution. Something is stirring in paddy fields across India. New seeds, new crop management techniques and newly minted food security policies are about to hit the countryside. Not all of the changes that are being forged in Krishi Bhawan, headquarters of the Union agriculture ministry, in the top-flight research institutions across the country, and in the boardrooms of leading global and domestic seed companies are visible as yet. But these policies could transform the country’s rice landscape, perhaps, in an unalterable manner. Driving past lush green rice paddies in Odisha’s Cuttack and Khordha districts, the picture seems timeless as ever. Farmers are surveying their ripening crop and counting panicles, the branching flower cluster that carries rice grains, to get an idea of the expected yield. It is a richly verdant tapestry that is on view for mile upon mile: the predominant expanse of high-yielding dwarf varieties broken here and there by fields of distinctively taller traditional rice plants. 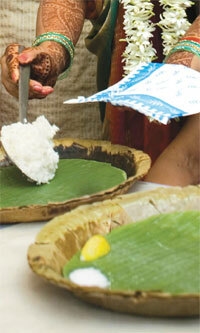 As one travels southwest to Koraput, the fields of traditional rice varieties appear to be more widespread. Here lines of colourfully clad women from tribal communities are working in the paddies, transplanting the same kind of rice they have been growing for centuries. This ageless picture of bucolic charm, so closely tied to the country’s culture and history, is, however, deceptive. There is a crisis in rice—both for the farmer, battling unprecedented changes in weather and escalating costs of cultivation, and the government, which needs to ramp up rice production by two million tonnes annually to ensure the nation’s food security. There are other concerns as well. India is a highly water-stressed country. Since every kilogramme of rice requires 4,000-5,000 litres of water, making it an ecologically unsound crop, there is a question mark over the issue of increasing rice production. The biggest worry is stagnant yields. India has the largest area under rice in the world—about 44 million hectares (ha)—but its productivity is way behind a dozen other countries. High-yielding varieties cover slightly over 80 per cent of the rice acreage, but the yields of these varieties—the result of decades of research by the huge network of public-funded institutions— have touched a plateau. Farm experts say the primary reason is poor agronomic practices. In contrast, China, the biggest producer of rice in the world, churns out 193 million tonnes of paddy on just 29.2 million ha, notching up yields of 6.61 tonnes per ha compared with 3.37 by India. There is a sharp dichotomy in the approach of the farmer and the policymaker on what can be done on this score. There lies a huge perception gap between the farmer’s search for sustainable livelihood and ecologically sound practices in the face of climate uncertainties and dipping water table, and the government’s focus on industry-promoted solutions for boosting rice yield. Let’s take a few examples. In Mandya district of Karnataka, paddy farmer Boregowda of Shivahalli village has switched to traditional rice varieties from the high-yielding Jaya and Tanu, which he was cultivating with chemical fertilisers and pesticides. Output had fallen from the initial 2.5-2.7 tonnes per acre (0.4 ha) to 1.8 tonnes, and given the cost of cultivation his farming was proving unremunerative. Besides, unpredictable weather was making his livelihood precarious. Boregowda started with his grandfather’s favourites, Coimbatore Sanna and Doddibatha. The varieties, revered for their drought-tolerance and special taste, had disappeared after the Kannambadi dam brought irrigation to the area. He now harvests 2.7- 3 tonnes per acre and gets a better price for his organically grown rice. At the other end of the country, in Koraput, the M S Swaminathan Research Foundation has given the tribals an assured income through conservation and cultivation of the scented Kalajeera rice. 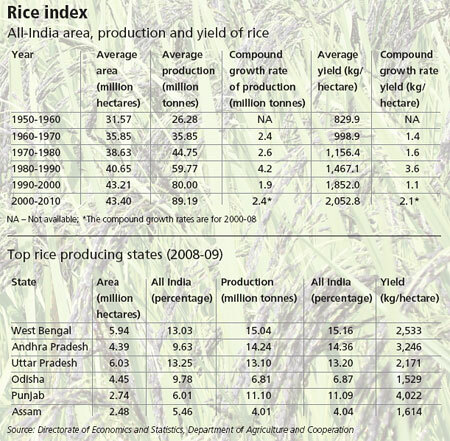 Starting with just 5.6 ha in 2002, the prized rice is now grown over 48.8 ha, yielding 134 tonnes in 2008. 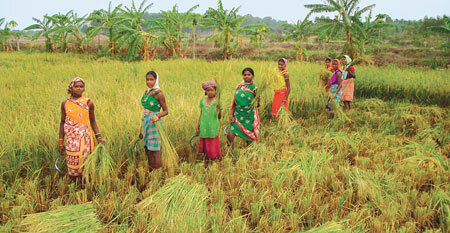 The rice, says Susanta Sekhar Chaudhury, senior scientist at the foundation, is fetching cultivators a handsome premium. There are countless such stories where farmers are shrugging off modern farm practices to return to the healthier cultivation of the past (see ‘The custodian of indigenous rice'). But can traditional varieties alone meet the country’s growing food needs? The Planning Commission estimates that India requires 122.1 million tonnes of milled rice by 2020 to meet food security norms. At the existing 1.34 per cent rate of growth India can hope to produce no more than 106 million tonnes. How is the country to bridge this deficit? A major initiative to meet this challenge was kicked off in 2007 with the launch of the National Food Security Mission which has been mandated to bump up rice production by 10 million tonnes by 2011-12. The three-pronged mission—for rice, wheat and pulses— has been allocated generous funds of Rs 4,882 crore with rice getting the lion’s share of Rs 1,963 crore. This year, Finance Minister Pranab Mukherjee announced another scheme, more ambitiously titled the Second Green Revolution for the eastern states, in his budget. With an outlay of Rs 400 crore from the Rashtriya Krishi Vikas Yojna (RKVY) funds, the thrust is to step up rice yield, along with that of pulses and oilseeds, in the states of Bihar, Jharkhand, Chhattisgarh, Odisha, West Bengal and eastern Uttar Pradesh. This is good news for the rainfed region that has received little attention from policymakers in the last six decades. While agriculturists believe the region holds the greatest potential for meeting the country’s galloping food requirements, there is a yet-to-be-settled debate on the path forward. According to Union agriculture minister Sharad Pawar the best bet is the Chinese model. At the first conclave of agriculture ministers of the newly designated Green Revolution states in July, Pawar said there was much to learn from the Chinese model of agricultural growth, particularly in using hybrid paddy. To ensure that the correct strategies were followed, he announced the formation of a special task force on hybrid rice. One of the primary objectives of the task force would be to foster the production of hybrid rice seeds through public-private-partnerships (PPPs) and make these available at reasonable rates to farmers. The belief is that only hybrid rice can bridge the yield gap of one-two tonnes per ha. Ashish Bahuguna, additional secretary in the agriculture ministry who heads the task force—it is made up of half a dozen bureaucrats—confirms that the Green Revolution interventions would willynilly be focused on hybrid rice. In fact, to fast forward the process, India would import hybrid rice seeds from China, Indonesia and Vietnam. “There is no need to reinvent the wheel. Our institutions can continue with their adaptive research but we can test these varieties for the next kharif,” Bahuguna says. This is a decision which could prove controversial. Two decades of concentrated research on hybrids by premier research institutions in the country—the Directorate of Rice Research (DRR) in Hyderabad, the International Agriculture Research Institute (IARI) in Delhi and the Central Rice Research Institute (CRRI) in Cuttack—have not made much headway. 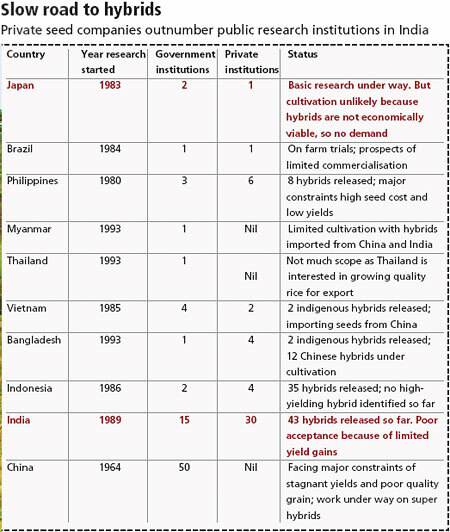 Since the 1990s, the Centre and states have released 43 hybrid rice varieties, of which 28 are developed by public labs. In addition, says Tapan Kumar Adhya, director of CRRI, 30-40 truthfully labelled hybrids developed by the private sector are being cultivated in the country. 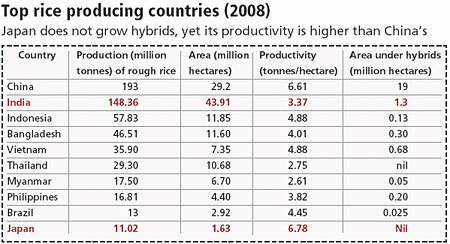 Yet, just about 3 per cent of the area under rice has gone over to hybrids (see ‘Sterile growth of hybrids’). “We can’t do without hybrids,” insists B C Viraktamath, director of DRR. “Varieties may give us five tonnes per ha but that crucial extra tonne per ha can only come from hybrids.” He, however, concedes that “increasing the yield should not be the only criterion” since it has “derailed the sustainability of rice production system”. Therefore, “the Green Revolution in eastern India should be ushered in based on the principles of sustainability, soil health and environmental protection”, Viraktamath says. He believes half the irrigated area under rice, that is 9-10 million ha, can be brought under hybrids if all goes well. DRR has just released its first hybrid variety in a marketing and licensing deal with four private companies. It is perhaps on account of such poor acceptance that the National Food Security Mission (NFSM), too, is focusing much of its energy on popularising hybrid rice. It has set a target of bringing three million ha under hybrids by 2011 although mission officials have not found the response of farmers encouraging so far. Mukesh Khullar, joint secretary in the agriculture ministry, who heads NFSM says, “Farmers don’t appear to see much benefit in using hybrids, and there are issues relating to quality and availability of the seed.” The mission provides financial assistance for production of hybrid rice seed, Rs 1,000 per 100 kg, because it concedes that “hybrid rice seed production is a very complex and risky task. The ultimate realisation per unit area in hybrid rice is very low”. Along with funds for distributing mini kits of hybrid and high-yielding varieties, it also offers assistance for conducting demonstrations on farmers’ field. Some of the eastern states have an issue with the priorities outlined by Pawar. A member of West Bengal Planning Commission, who did not wish to be named, says, “The large-scale transition to hybrid rice in India is not practical since the input costs are too high and it’s not easy to convince farmers. Besides, hybrid rice requires better irrigation management which is not possible everywhere in West Bengal.” In any case, even with the existing semi-dwarf high-yielding varieties, productivity of four-five tonnes per ha is achievable. There are other gripes. S K Samanta, joint director of research at Bidhan Chandra Krishi Viswavidyalaya, an agricultural university in Kalyani, West Bengal, points out that state agricultural scientists were not consulted during the formulation of the new Green Revolution plan. What has been overlooked in the formulation of the plan is that most farmers here are small and marginal landholders. They are efficient in crop management but are not suited to farm mechanisation, which is a significant component of the plan. Overall, the obsession with promoting hybrid rice as a priority has not gone down well with the larger community of agriculture scientists. They point out that the new stress-tolerant varieties that have been introduced in several states have done much to revive the fortunes of rice cultivators—and add to the foodgrain kitty. One of the biggest breakthroughs has been the development of rice varieties that can take on prolonged submergence, drought and grow well in extreme salinity. Uma Shankar Singh, South Asia regional project coordinator of the International Rice Research Institute’s STRASA (Stress Tolerant Rice for Africa and South Asia) project, points out that a significant strategy to enhance rice productivity in rainfed areas and mitigate the impact of climatic changes is to go for stress-tolerant rice varieties. A major success of the STRASA project in this line, partnered with the Central Rice Research Institute, is Swarna Sub1, which can rebound after over two weeks of submergence and is seen as a breakthrough for coastal areas. Similarly CSR36, a salt-tolerant variety developed by the Central Soil Salinity Research Institute in Karnal, Haryana, is performing exceptionally well. Stress-prone rice area in the country accounts for as much as 24 million ha, of the 44 million ha, posing a huge challenge for stabilising rice production. All of this appears to have led to a quiet war in the research community over the right rice strategy for India. According to insiders, a group of scientists from the apex Indian Council for Agricultural Research (ICAR) has brought up this issue with Pawar and Krishi Bhawan officials, pointing out that tilt towards hybrids would only benefit the private seed companies. Hybrid seeds cannot be reused by farmers like other seeds and have to be procured each season from the developer. “Is it surprising therefore that private seed companies are not interested in inbred seed research but are focusing almost exclusively on hybrids?” asks a senior ICAR scientist who has worked on international programmes. The new Green Revolution may well usher in a rice revolution in the east but before that it could lead to a bitter battle for India’s rice market. Jai Sri is a common greeting in the Koraput countryside these days. A Paraja tribal woman working in her fields, a passing motorcyclist driving through the rutted lanes, a teacher heading for his school, they all greet each other and visitors with a Jai Sri. It has nothing to do with religious revivalism, but is the new buzzword sweeping the farmlands of Odisha—and large patches of India. SRI is the acronym for System of Rice Intensification, a new technique to grow rice more efficiently using much less water and seeds but yielding far greater quantities of rice. It is a system that is being spread by a band of somewhat unlikely evangelists: academics, non-governmental organisations (NGOs), top-flight charitable trusts, crop research institutions, wildlife organisations, the World Bank and most surprisingly the Government of India. Muralidhar Adhikari, who works with Koraput NGO Pragati, exemplifies the spirit of the SRI missionaries. He goes from farm to farm with a message that comes across as heretical to rice cultivators. Stop growing rice in standing water, use as little of the precious resource as possible, reduce seed consumption and throw out pesticides and chemical fertilisers. “Initially farmers are sceptical and it takes a lot of convincing to get them to try SRI,” says Adhikari, district coordinator of Pragati which is channelling most of its energies into transforming rice cultivation in this backward tribal district of Odisha. In SRI 8-14-day seedlings instead of the normal three-four-week-old seedlings are transplanted at wider spacing through a marker system for uniformity. Only one seedling is planted per hill. Water is used sparingly to keep the soil moist (alternate wetting and drying) but not continuously flooded. Weeding is carried out mechanically through a rotary weeder (small hand-driven machine), but instead of throwing out the weeds these are pushed into the soil for aeration and providing organic compost. Use of farmyard manure is encouraged because SRI cultivation responds better to organic fertiliser than chemical fertilisers. Seedlings are raised in unflooded nurseries, not planted densely and have to be well supplied with organic matter. There is an option of direct-seeding, but transplanting is common. Seedlings have to be transplanted quickly and carefully in a square pattern, usually of 25x25 cm, to give roots and leaves more space to grow. It is these simple but time-consuming and intermittently labour-intensive practices that could prove the saviour of rice farmers, increasing yield between 30-80 per cent and cutting down water consumption by as much 40 per cent. Seed use, too, is drastically pared. Ask Duddeda Sugunavva, a 38-yearold Dalit farmer from Katkur village in Warangal district of Andhra Pradesh. The delighted farmer, who works on two acres (0.8 ha) of leased land, says, “I was reluctant at first to try a method that was completely contrary to what I’ve been used to for decades.” But grudgingly she tried out SRI on about one-tenth of an acre. But after harvesting six 70-kg bags rather than the usual four bags from that plot, she quickly extended the technique to the entire two acres, and has now been using only SRI practices for five seasons. Transplant 8-14-day seedlings, instead of the normal three-fourweek- old seedlings, at wider spacing. Use marker system for uniformity. Plant only one seedling per hill. Use water sparingly to keep the soil moist, but do not flood the field continuously. Weed with a rotary weeder and push them into the soil for aeration and organic compost. Use organic fertiliser. Her take-out is pretty stunning. Compared to the 35-40 bags of rice from one acre (2.8 tonnes/acre) that she would harvest earlier, Sugunavva now gets 55-60 bags (4.2 tonnes/acre). 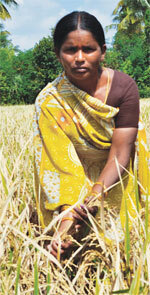 She has more reason to smile: costs have been slashed by Rs 4,000 per acre. SRI in Andhra Pradesh is spearheaded by the World Wide Fund for Nature in collaboration with the International Crop Research Institute for the Semi-Arid Tropics (ICRISAT)—an unusual partnership aimed at promoting more efficient use of water in agriculture. The World Bank, too, is a champion of SRI. Working with Tamil Nadu to improve its irrigation service delivery, the Bank has helped to bring around 450,000 ha under the SRI system. Its logic: “any significant growth in agriculture depends on increasing the efficiency and productive use of water.” It warns that by 2020, India’s demand for water will outstrip all sources of supply. Since India needs to increase rice production by 2.5 million tonnes a year, it cannot hope to do so by the conventional method of cultivation. That guzzles 4,000 to 5,000 litres of water per kg of rice. Nor can it expand its irrigated area to the required level because of constraints on land and water resources. One reason Tamil Nadu is promoting SRI is because it is one of India’s driest states, getting just 925 millimetres of rainfall a year. The per capita availability of water resources is 900 cubic metres a year compared with an average of 2,200 cubic metres for the country. And agriculture consumes 75 per cent of the state’s water. Perhaps as a result of Tamil Nadu’s project, SRI has caught the imagination of the mandarins in Delhi, too, which has set aside Rs 8 crore under the National Food Security Mission to propagate SRI in the selected districts where the programme runs. The mission has a target of covering five million ha by 2011-12 and is a key element in efforts to push up rice productivity. NGOs are the foot soldiers of this innovative programme with nodal organisations stringing together district- wide networks to reach as many small and marginal farmers as possible. The NGO network from Pradhan in Bihar to CROPS in Jangoan, Andhra Pradesh, has been made possible thorough generous funding from private charities. The largest donor is the Sir Dorabji Tata Trust, which has selected SRI as one of two major initiatives under its natural resource management and rural livelihoods programme. Biswanath Sinha, senior programme officer with the Trust, says it started with an initial allocation of Rs 11 crore in 2007-08 and has upped the figure to Rs 24 crore for 2010-11. Matching funds have come from the public sector. NABARD, for one, has taken up SRI in earnest and allocated Rs 16 crore for the programme. It is also putting together data to prove SRI’s efficacy. According to a survey compiled by its Raipur office, yield increases are as high as 50 per cent. Scientists, however, are yet to be convinced. U S Singh of the International Rice Research Institute’s (IRRI’s) STRASA programme in Delhi insists that there is no scientific data to corroborate the claims made by SRI proponents. IRRI incidentally promotes the direct-seeded technique of rice planting which also avoids the conventional puddling and submergence practices. Shambu Prasad, associate professor at the Xavier Institute of Management, Bhubaneswar, who has put together a national alliance on SRI, believes that scientists tend to be dismissive of SRI because the technology has come from the farmers and not the formal research establishment. He admits that there are issues with SRI. One is labour costs. Although small farmers can come together to do the tansplanting and weeding at the critical times, costs can be a concern when farmers have to hire labour for these chores. One yardstick of the technique’s success is that SRI is being adapted for a range of other crops from wheat to millets. Modern agriculture, Prasad concedes, has been the most successful system of production in history. But it has also been the most stressful for natural resources—for soil, water and air. What is needed now is grassroots innovation that relieves these stresses. Latha, thats a nice attempt to analyze the rice picture. the major problem is comparing with china. chinese have a different ecological conditions compared to india why should we compare our yields with them? the day length, diurnal variations in temp etc also matter in influencing yields. apart from this the support to rice farming is also vastly different unlike india. instead of improving upon the diverse rice growing practices across the countries which evolved due to local ecological requirements, the mad monoculture of ponding rice with few varieties with narrow genetic base and high chemical and water use has led the serious crisis. the pricing policies in india are highly disincentivised for farmers. importing seed from china will proove disastrous to indian farming. This entire push for hybrids is to pave way for GM rice in this country and not for the ecological security or economic security for the farmer. You have made an attempt to explore many facets of the rice conundrum, however the farmer seed savers who have kept rice alive for 10,000 years dont figure anywhere. And of course in this whole debate you are ignoring the significant and wonderful work which is taking place in different states ranging from the himlayan foothills to the rice bowl jharkhand to the karnataka to struggling kerala with regard to paddy seed conservation and reclaiming seed sovereignty! Why is it that we have ignored farmers and continue to ignore them? Why dont we ask them what works and what doesnt? Why dont we make them part of the decision making process? It is only the farmer who can GROW rice can SAVE rice....! A debate on Green Revolution is not new in India. It has been there since the eighties when the yields got stagnated and the impact of pesticides and fertilisers were observed by farmers and experts .The debate got intensified in the nineties when exploitation of water resources and its impacts were pointed out by many . On top of this the issue of farmer suicides unleashed a series of debates in the country about the long term economical and ecological sustainability of chemical agriculture in a country like India where farming is both a food security and livelihood security issue. Meanwhile many individuals and organisations started promoting an alternate approachin farming and many farmers started experimenting on it. And now the country has started to benefit from it . The way forward is with locally appropriate seed diversity , resources and low cost package of practices which majority of our farmers in this country can practice without getting caught in debt trap and without destroying the natural resources. It is shocking that the same institutions which promoted Green Revolution earlier are pushing the same in eastern India , but with more costly and unstable technologies. This time they join with private companies also ! And they continue to say that this is the only way to ensure food security. Nothing can be more stupid than this argument. It is clear that scientists and the seed companies are taking the farmers in the eastern states for a ride through the introduction of Hybrid Rice. Rice is a crop which has the highest diversity and we have lost quite a good number through the first Green Revolution and farmers are trying to revive what ever is left because they have realised that HYVs and hybrids can not solve the issues which concern them: pests, drought, flood, salt intrusion etc.. They donÃ”Ã‡Ã–t spend crores to develop these varieties unlike the scientists, and these varieties perform well in thelocal conditions. Dr Richharia who understood both the potential of indigenous rice varieties and the situation of farmers had put forwarded an approach for the development of seeds, especially rice , which is relevant even now. But who cares? Scientists have a technology to sell and they have all the support from the Ministry of Agriculture . Organic is the only logical way forward. the biggest challenge however is to keep industry lobbyists from peddling there so called solutions on us by bribing politicians and opinion leaders. the industry works in an insidious way, and untill we have strict agri laws, poor farmers will continue to have business minded propaganda showed down their throats.